In 2012, a dozen states will decide the Presidential election. The PurplePoll focuses exclusively on the Purple Electorate - likely voters only in these swing states. Updated regularly throughout the 2012 election cycle, the PurplePoll offers unique lens through which you can gather original insight into this critical election. The PurplePoll, by Purple Strategies - a bipartisan organization - brings together strategists and communication specialists from across the political spectrum. 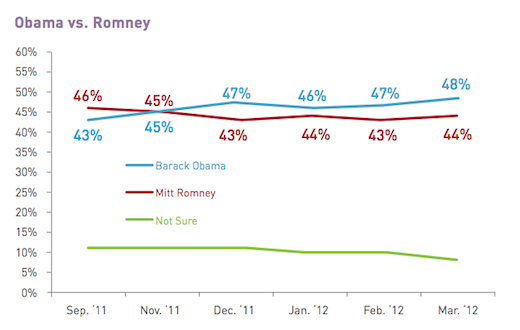 Currently, President Obama leads Mitt Romney 48%-44%.